have been implicated as potential mechanisms of protrusion in such cases, the exact pathogenesis has not yet been elucidated. 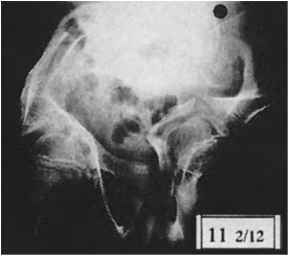 Protrusion of the acetabulum is relatively frequent in patients with sickle cell anemia. Again, the ultimate cause is unknown, but impaired growth of the triradiate cartilage and diffuse chondrolysis of the articular cartilage, both possibly related to vaso-occlusive episodes, are putative mechanisms (Hernigou et al. 1991; Schumacher et al. 1993). Idiopathic chondrolysis of the hip is a monoar-ticular disease most commonly affecting adolescent girls, manifesting with hip pain, restriction of motion, and stiffness in the absence of any previous history of trauma. Diffuse loss of the acetabular and femoral articular cartilage occurs. 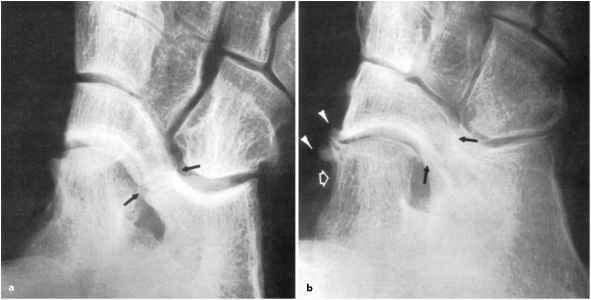 Radiographs show joint space narrowing, irregular and eroded subchondral bone, regional osteoporosis, and mild protrusio acetabuli (Hughes 1985). 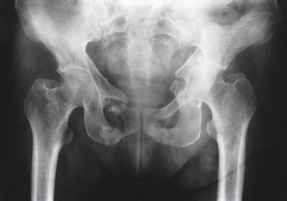 The condition can mimic juvenile chronic arthritis, septic arthritis, transient osteoporosis of the hip, os-teonecrosis of the femoral head, and pigmented vil-lonodular synovitis (Resnick and Niwayama 1995; Sherlock 1995). Protrusio acetabuli associated with Marfan syndrome (OMIM 154700) and Ehlers-Danlos syndromes has been linked with intrinsic weakness of the bone (Fast et al. 1984; Yule et al. 1999). As discussed in more detail elsewhere in this book, the skeleton is diffusely osteoporotic in patients with osteogenesis imperfecta, owing to defective synthesis of the collagen matrix coupled with deficient mineralization of the matrix. Bilateral protrusio acetabuli resulting in a 'trefoil' appearance of the pelvis occurs in association with severe coxa vara in teenagers with severe osteogenesis imperfecta (Hanscom et al. 1992) (Fig. 4.19). In Bruck syndrome (OMIM 259450), features of osteogenesis imperfecta and arthrogryposis multiplex congenita occur in combination (Fig. 4.20). The molecular defect underlying this syndrome is a deficiency of bone-specific telopeptide lysyl hydroxylase mapped to 17p12, resulting in aberrant crosslinking of bone collagen (Bank et al. 1999). The disorder manifests at birth with symmetrical contractures of large joints and pterygia, and in subsequent weeks with multiple rib and long bone fractures resulting in bone deformities, osteoporosis, vertebral wedging, kyphoscol-iosis, and persistent wormian bones (Leroy et al. 1998; McPherson and Clemens 1997; Viljoen et al. 1989). lescence or adulthood, and range from none to severe hip pain, limitation of hip motion, flexion contracture, and abnormal gait. Radiographic manifestations include diminution of the joint space, with axial or medial migration of the femoral head and osteoarthritic changes. An estimate of the direction of femoral head migration with respect to the acetabulum - whether axial and medial, as in primary protrusion acetabuli, or superior, as in degenerative joint disease - is helpful in the differential diagnosis against the latter disorder. 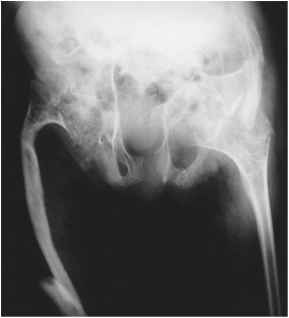 Axial migration of the femoral head occurs in rheumatoid arthritis, anky-losing spondylitis, chondrolysis, disuse cartilage atrophy following paralysis, and calcium pyrophosphate dihydrate crystal deposition disease (Resnick 1995).